Having provided both FTP and web hosting services for over a decade, DriveHQ has become a popular solution for editing tools that directly connect with FTP servers. One such editing tool is Adobes' Dreamweaver. Please refer to the steps below for instructions on how you can configure your Dreamweaver site (or similar editing software with FTP functionality) to upload to your published DriveHQ site. Pleae also keep in mind that you need to be a paying member in order to use the web publishing feature. 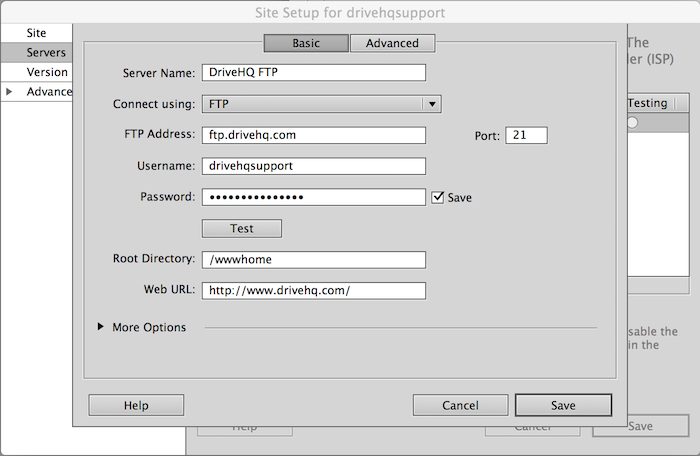 3) Make sure you enter your username and password exactly as you do when you logon to DriveHQ, and are using ftp.drivehq.com as the FTP adress. 5) If you do not see the sucessfully connected message appear, then either you do not have a paid subscription on DriveHQ, something was entered incorrectly, or you have something within your local network that is restricting you. Please try connecting with a standard FTP client such as FileZilla and try connecting this way. If you also cannot connect with this FTP client, something on the network or device is limiting. Please contact support@drivehq.com and test with a diferent network/device to double-verify this.